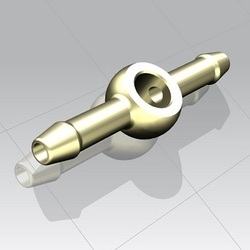 - Thread Size 1/8" to 3/8"
18 mm banjo connector (brass). With the years of knowledge and proficiency in this arena, we are engaged in offering a comprehensive Metal Banjo Hose that meets on consumers demand. Manufacture of all kind of banjos from 6 mm to 18 mm bore dia and all kind of angel joint , ballsockets and ball stud, from 6 mm to 14 mm thread size. Our company holds vast experience in this domain and is involved in offering Hydraulic Banjo Connector. Used in Lubrication as end fittings come in different lubrication line sizes and different with thread sizes. Our clients can avail the best collection of designed Swivel Banjo Connectors for various packing requirements. These are made of high grade material as per client request. All our connectors are more in demand for longer working life and les maintenance. Our client can avail from us 10mm Steel Banjo Tee Different Shapes & Sizes 10mm to 12mm. Offered product is precision engineered using quality raw material in compliance with international quality standards. Assisted with highly progressive techniques at our well-developed manufacturing unit, we are able to provide a wide assortment of Assembly Banjo Pipe. Our offered benjo pipe is designed with the usage of optimum grade material and extremely advanced technology in tandem with globally accepted set of parameters.